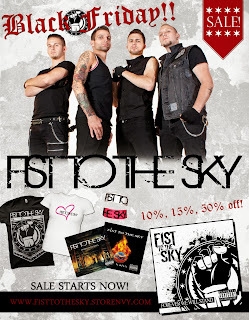 Fist to the Sky- Upcoming Show Tonight, Nov 30th, at 7:00pm! Exactly 2 years ago, the original line-up of Black Sabbath gathered to announce they were reuniting and would record a new album and plan a world tour. Legendary producer Rick Rubin, who had recently managed the recording of Metallica's return-to-form album Death Magnetic, was also revealed to be their producer. It was the biggest news for heavy metal music of the millennium. The press conference instantly stoked high expectations among the most loyal metal fans around the world. Since then there have been a few set backs. First there was a contract dispute between the band's management and drummer Bill Ward, which unfortunately could not be resolved. To fill the void at the drum spot Brad Wilk (from Rage Against the Machine and Audioslave) was brought in. His previous work under Rubin's production with Audioslave was a plus. Just when things seemed to be back on track, guitarist Tony Iommi was diagnosed with lymphoma, a form of cancer affecting white blood cells. The recording process went immediately on hold as Iommi began treatment. However, in spite of the obstacles, the band members pulled themselves up by their bootstraps and the album was completed. Black Sabbath. 13. A collection of songs that surprised me in spite of my skepticism. I had always thought the vibe of the original Black Sabbath albums would be forever lost in the '70's. The diligence and determination of the band members along with Rubin's goal-driven guiding hand on the production board have truly and thoroughly proven me wrong. Rubin has succeeded with recapturing the band's original sound on 13 as much as he did with Metallica's Death Magnetic, if not more! The opening track, 'End of the Beginning', starts with a simple chord progression in tones that immediately recall the early-Sabbath sound. After a few measures the song transitions to a slow and haunting series of notes from Iommi's lead guitar, and can you hear the fabled diminished 3rd, or "Devil's 3rd", in that riff? I must say yes! Finally Ozzy's voice joins the mix, a long anticipated moment, and the magic of what Black Sabbath should be has been restored. It's almost as if they tried to recreate the song 'Black Sabbath' on purpose, yet there are also parts that sound similar to 'Breaking Into Heaven' (from the last Heaven and Hell album, The Devil You Know.) In any case, by this point any reservations I had held about this reunion have been dispelled. For the next couple songs, 'God is Dead?' 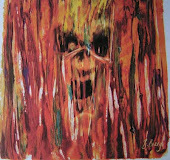 and 'Loner', they continue in the same vein with reestablishing the classic Sabbath sound. The guitar tones remain reminiscent of their works from their debut album through Sabbath Bloody Sabbath. 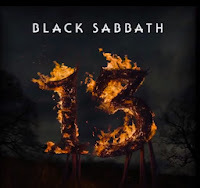 With Ozzy's voice, Geezer and Iommi on bass and guitar, and Brad Wilk doing an impressive job of playing an 'old-school-Sabbath' drumming style this album is living up to expectations, if not exceeding them. Lyrics are challenging conventional religion, and tackling social and political issues left and right. Struggles between good and evil, Satan and God, heaven and hell are omnipresent throughout 13. Another personal highlight is the track 'Zeitgeist'. It does a better job of recreating the vibe of 'Planet Caravan' than anything else. Eerie reverb effects on Ozzy's vocals, lyrics centering around the esoteric concept of space and time, the gentle strumming of an acoustic guitar, and even the soft bongo-style percussion; it is arguably better than the first 'Planet Caravan'! The final track on the album, 'Dear Father', is another classic of Sabbath style, with the heavy, low-end guitar tonality, lyrics that beg the elusive higher-power of God for reasons of our existence, and a minor-key chord pregression to add just the right amount of doom and gloom. But then, after the music fades, there is a last little surprise for the old-school Sabbath fan in all of us: the original thunderstorm sounds effect from the intro of the very first Black Sabbath album. A bold statement to incoporate such parallells with their past, but in this case, appropriate! Fist to the Sky return to Penny Road Pub! 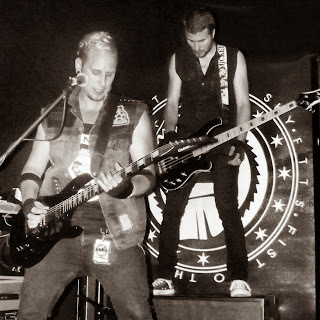 Tomorrow night, November 9th 2013 the reigning Independent Band of the Year here at www.happyheadbanger.com are performing at Penny Road Pub in South Barrington along with Like a Storm and Man the Mighty. FIST TO THE SKY have been busy this year, playing shows constantly, and recently released their EP 'Forever We Will Stand'. Don't miss another great opportunity to hear them live!